How easy RQD estimations are? RQD was introduced by D. U. Deere in 1964 for a quantitative description of rock mass. 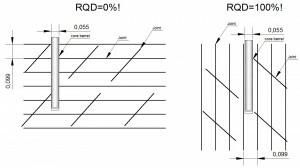 The RQD is defined as the percent ratio of the sum of core pieces with higher than 10cm length to the total drill run. Based on the percent or RQD from 0-100% the rock mass quality can be assessed. For example based on the proposal by Deere, rock mass with RQD<25% is characterized as “very poor”. If RQD is higher than 75% it is classified as “Good”. The RQD estimation is generally easy in the field and has gained a wide popularity. There are issues that should be addressed every time such estimations are made in order to avoid misleading results. In the following some personal experience will be provided regarding this issue. The diameter of drilling core used should be known and taken into account. In the ISRM Suggested Methods, Brown 1981 a NX (55mm) drill core is mentioned, but in recent years the diameter has significantly increased in many projects and the sample is no more 55mm but can easily be 110mm. The increased diameter has one advantage that better quality core samples can be obtained but at the same time they can include more discontinuities. It is not clear if you will obtain higher or lower RQD values without recognizing the joint system. In the first figure it is observed that the sample with smaller diameter presents more fractures (some may be due to drilling). The type of drilling barrel is very important. Different quality of drilling can be succeeded with double barrel (which is suggested) or split double core barrel than single or triple core barrel. The triple core and the double split barrel usually produce similar results unless the material is very much fractured. In that case RQD values would be zero anyway. The driller’s capability may be among the most important aspects especially for rock masses that are fair and poor. In the same location, with the same equipment different drillers may produce different results. Sometimes the artificial fracturing due to drilling may be easily identified but many times they are not especially in certain types of rocks described bellow. The rock type is extremely important. Geological material wi th foliation and bedding can produce misleading results of natural discontinuities. Clayey like rock materials such as shale, mudstones, siltstones can produce false impressions of discontinuities that are made during drilling but appear to be natural. 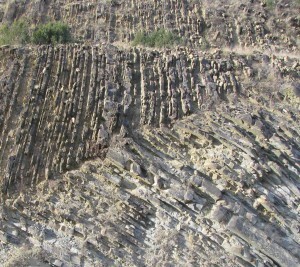 In such materials especially when tectonically disturbed, they can appear as solid samples but have discontinuities that are not easily visible. In such situation RQD estimates have to be used with great caution. 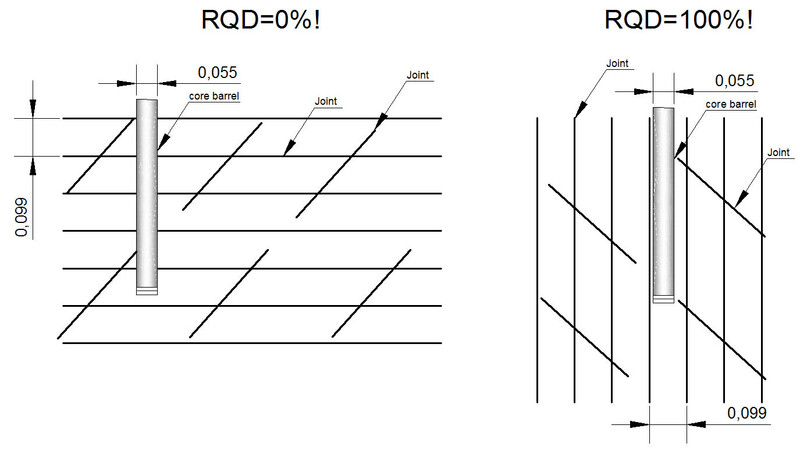 Number of joint sets and orientation, especially orientation can have a profound effect on RQ D estimation. 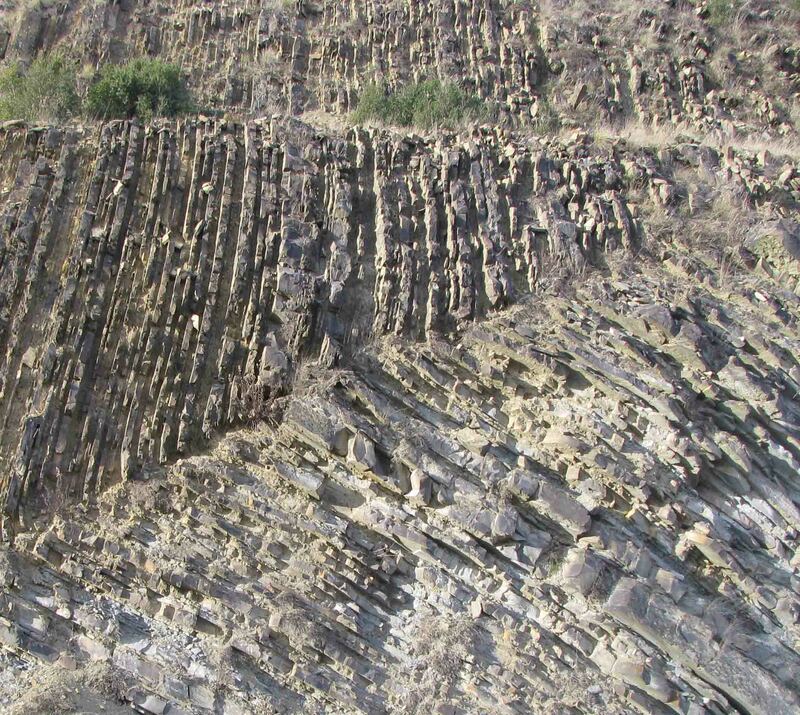 For example vertical or near vertical joints may produce 100% RQD in a rock mass that has a discontinuity spacing of just 11cm. This can happen even in horizontal joint sets and a have the following results of RQD=0 for horizontal joint with spacing of 9.9cm and 100% for joint spacing of 10cm! So when evaluating RQD values, due consideration should be given to the material type, Driller, drilling equipment, geology and structural features of the rock.